What does it mean for data bins to be “independent” in a binned distribution (like, for instance, the time series of the number of newly identified disease cases each week)? This means that the stochastic variation data in the i^th bin is uncorrelated to the variation in the j^th bin. You should be aware that for epidemic data, this assumption is perhaps (probably) not satisfied, but the academic body of work related to this topic currently has not come up with a good way of assessing the bin-to-bin correlations, so for now we have little choice but to assume they are uncorrelated. Note that the assumption of independent bins underlies the Maximum Likelihood, Least Squares and Pearson chi-squared methods, unless special modification is made to those methods to take the correlations into account. [In this module, students will learn about probability distributions important to statistical modelling, focussing primarily on probability distributions that underlie the stochasticity in time series data. How to determine if stochasticity on data is the same. Sometimes we may want to determine if there are apparent “clusters” in our data (perhaps temporal/geo-spatial clusters, for instance). 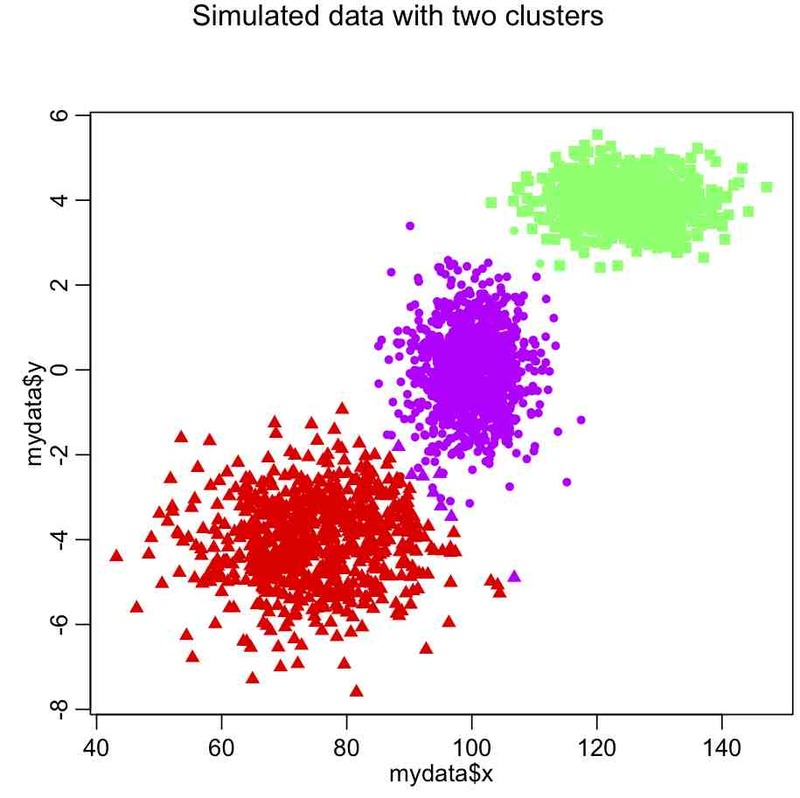 Clustering analyses form an important aspect of large scale data-mining. K-means clustering partitions n observations into k clusters, in which all the points are assigned to the cluster with the nearest mean. If you decide to cluster the data in to k clusters, essentially what the algorithm does is to minimize the within-cluster sum of squared distances of each point to the center of the cluster (does this sound familiar? It is similar to Least Squares). 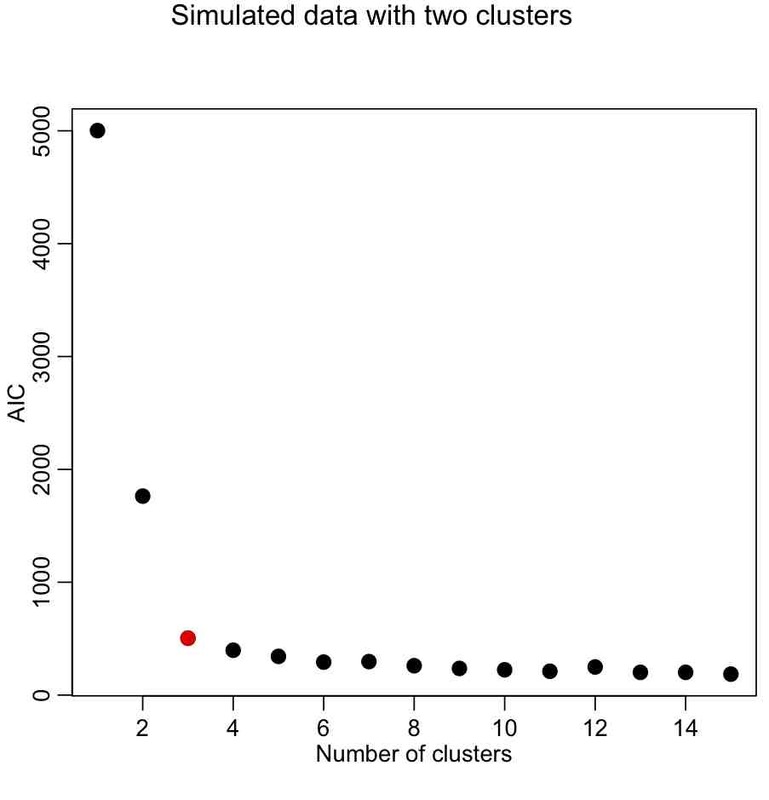 How many clusters are in the data? 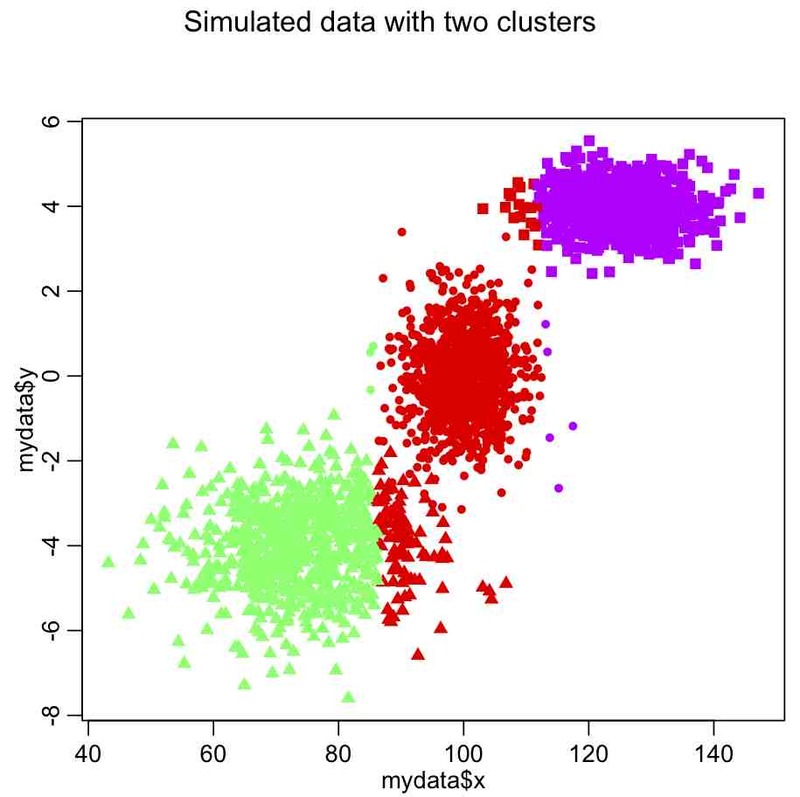 You likely want to explore how many distinct clusters appear to be in the data. 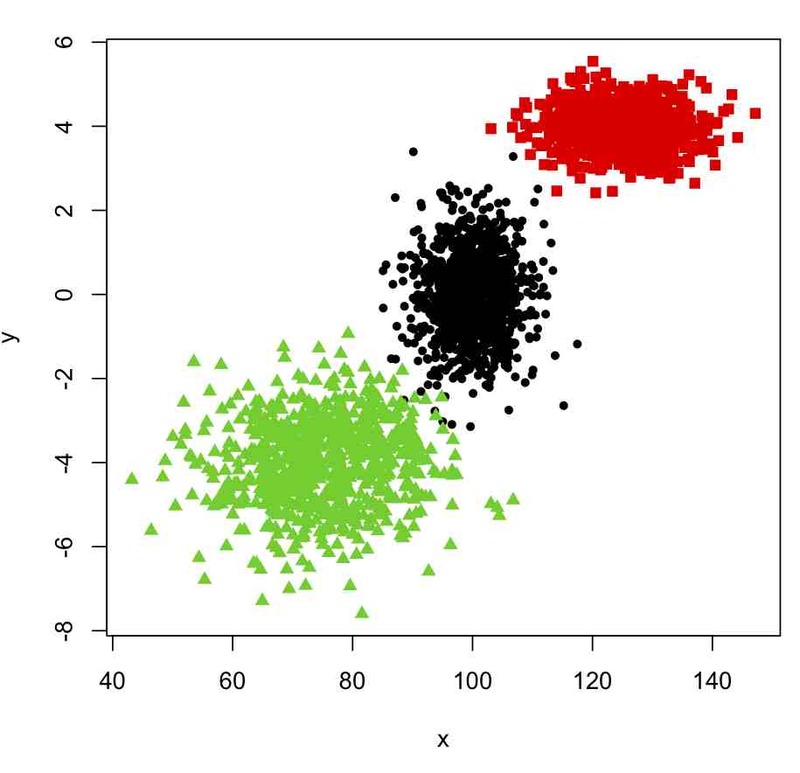 To do this, you can examine how much of the variance in the data is described by our “model” (which in this case is the clustered data). Just like for a linear least squares statistical model, we can thus calculate an adjusted R-squared from the total variance in the data and the sum of the within group variance. There is also a way to calculate the AIC for a kmeans model. In most cases, however, the number of clusters won’t be so obvious. 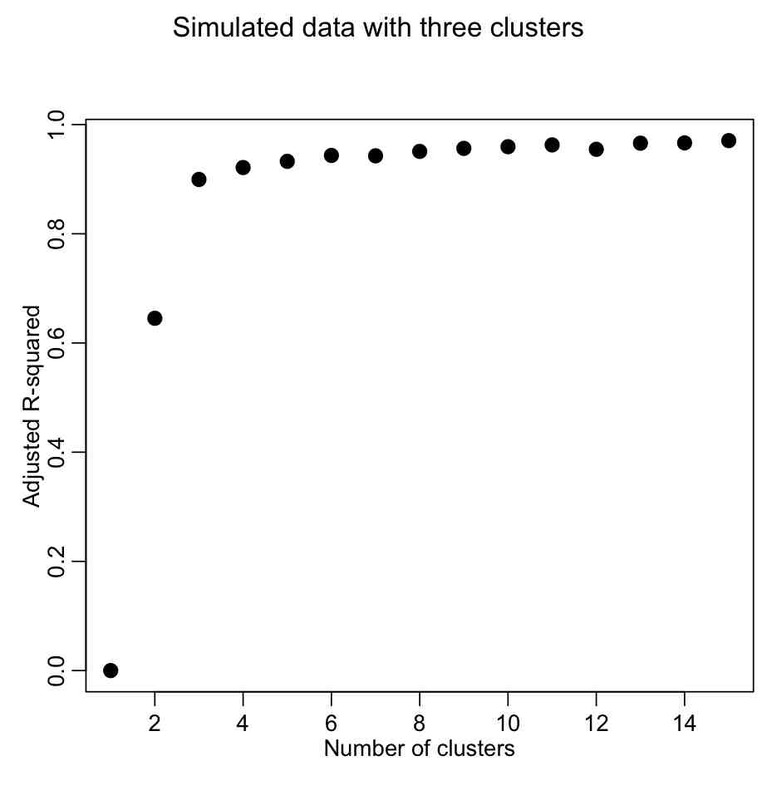 In which case, we would need to use a figure of merit statistic like adjusted R^2 or (even better) AIC to determine which number of clusters appears to best describe the data. We want to describe as much of the R^2 with the fewest number of clusters. The usual method is to look for the “elbow” in the plot, and that is traditionally done visually. However, we could try to construct a figure-of-merit statistic that identifies the elbow. In the AML610 course, the students and the professor developed a quantitative method to formulate a statistic to identify the elbow point. We call this statistic the COMINGS-elbow statistic (after the first initials of the students who came up with the algorithm); the statistic looks for the (k,aic) point that has the closest euclidean distance to (1,min(aic)). However, we noted that the performance of this statistic in identifying the elbow point was improved if we first normalized the k and aic vectors such that they lay between 0 to 1. Thus, the elbow point is identified by the (k’,aic’) point that is closest to (0,0). This figure-of-merit for elbow location doesn’t seem to work optimally. Can we think of a better one? Again, we are looking for the elbow point in the plot. With the AIC, our elbow locator FoM seems to work better (in this case, anyway).